During my senior year of college, there was a term when I had two classes in the same building, 45 minutes apart, right at midday. It wasn’t quite enough time to go home and eat, especially since it was winter and the sidewalks were always slushy. So for about 3 months, I ate at Wong Gei Restaurant about three times a week. I wandered through the menu, trying all the different noodle soups and Cantonese-American standbys. One dish, though, I kept returning to: chicken with egg on rice. There were a number of other “with egg” dishes, too: shrimp, beef, pork, Chinese sausage, even sometimes tomato on the special board. They were all simple omelet with scallions, draped over a bed of rice, and they were exactly the right kind of light but filling, comforting, savory food to send me off to an upper-level literature class through the snow. In the years after, once I moved away for a while (and Wong Gei closed), I tried to recreate that dish but could never get it quite right: The texture would be too heavy, the sauce too thick. Even if they weren’t quite right, though, the omelets were all still perfectly tasty, and I was happy to eat them. In fact, that’s the recipe I intended to share right in this space: the weather has finally turned cold, I’m feeling a little under the weather, and this recipe that I haven’t made in years seemed just the thing for lunch. But then I ran into a problem. When Jarod and I got married a few year ago, his cousins got together and gifted us all new pots and pans, nice solid Calphalon tri-ply numbers. I loved them immediately, and I gave away most of my old cookware, including a set of nonstick skillets. I didn’t worry about it much then — I have a large nonstick pan for the rare occasions when I need the Teflon, but I honestly don’t much like cooking in nonstick — but today I realized: the medium nonstick skillet was my Chinese omelet pan! I didn’t have a pan to cook in! Except, of course, I do. I have a wok, which is almost certainly what Wong Gei used, anyway. Still, I was worried: I couldn’t quite remember, but I thought I might have tried the wok when I was first experimenting, and I’ve definitely had plenty of annoying experiences scraping caked egg off of woks. But I really, really wanted that omelet. So: nothing ventured, nothing gained, and I’ve had a lot of learning since I first started cooking in earnest. As you’ve guessed, given that I’m writing this up, the wok worked fine. More than fine, in fact. I was amazed to see, appearing on my stove, my long-lost omelet. Spotted with brown crispy spots and flecks of green onion, soy sauce and sesame oil soaking into the grains of rice below, it was a fond memory come to life in my kitchen. Inspired by a dish at the now-closed Wong Gei restaurant in Columbus, Ohio; Yau’s Chinese Bistro serves a very similar dish. 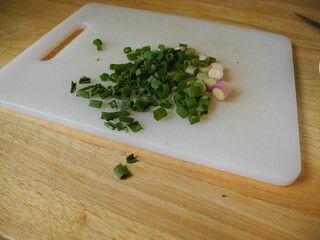 Mix the scallions into the egg and set aside. 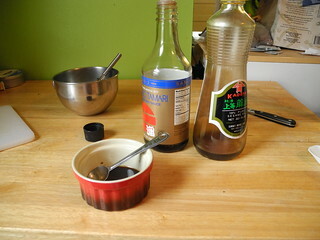 In a small bowl or ramekin, combine the soy sauce and sesame oil. The omelet cooks very quickly, so plate your rice before you begin cooking. You’ll want to pile it in the middle of a plate, in a low flat mound. Pour the oil into a wok, and heat over high flame until you see tiny tendrils of smoke coming off of the oil. (You need nice hot oil to prevent sticking.) Swirl the oil lightly to coat the bottom of the wok sides, then pour in the egg mixture. 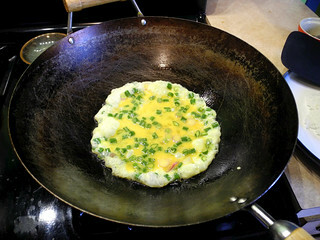 The egg will immediately begin bubbling up and setting at the edges; tilt the wok to pour the liquid toward teh side of the omelet to set. 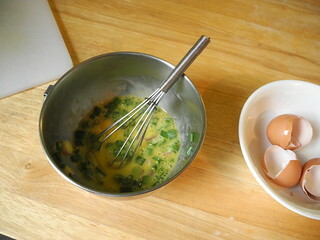 When there is only a bit of liquid egg remaining (which will be soon, 30-60 seconds), flip the omelet with a wide spatula. 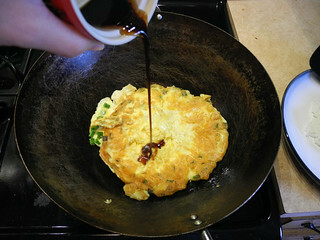 Let second side cook for 15-30 seconds, then pour the soy sauce-sesame mixture on top and flip once or twice more to coat both side of the omelet. Slide out of the wok onto the rice, and serve immediately. I love this dish as-is, but if you’d like to add about a quarter-cup of chopped meat or vegetable, that would be very nice, too. (And a great way to use up little bits of things from the fridge. 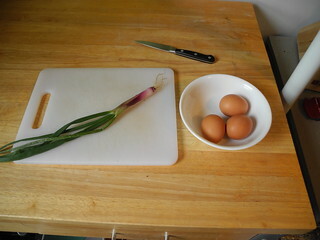 The cooking time is very short, so additions need to be pre-cooked; stir them into the eggs along with the scallion. If you don’t have a wok, or don’t feel like using one, this should work in a flat skillet. A well-seasoned cast iron pan would go nicely, and theoretically even a plain stainless steel skillet should work, though you might need more oil to avoid sticking. Or, of course, you could use a non-stick skillet — I won’t tell!